Freebie Friday Catchup and Sneak Peeks! Before I show you what's up for graps this week, do bare with me one second while I share a few sneak peeks of some more goods that will be available on the website. :) We had another little photoshoot yesterday, so I had to share these before I forget! I still need to photoshop them, along with hundreds of other photos (joy! ), but I am making progress. This whole photography thing is really a job in and of itself...and I have so many one-of-a-kind items that need to be photographed individually, that it takes time. I know, I don't make it easy on myself....and Superwoman, I am not....so I need to definitely make changes in this process for future shop updates for sure, lest I get my first strand of gray hair! Okay, enough of that...on to the goods. So, let's get back on track. I missed 4 weeks of goods, so they'll be 4 winners this week. 2 people will be chosen to receive 1 yard each of the adorable Japanese linen anchor print fabric (courtesy of my Japanese fabric distributor) shown. Then 1 person will get the Amy Butler Nappy Bag pattern and 1 person gets the incredibly chic Kimberly Bag Pattern (both patterns courtesy of Amy Butler Designs). Those of you on the mailing list (see the right side bar to join up if you have not already done so) get one entry automatically. Leaving a comment here gets you another entry. So if you are on the mailing list and you comment here, you get 2 entries. When you leave your comment, tell me which item you'd prefer, that way, when I draw your name, you get first dibs on the item you really want! Feel free to also tell me what you've been up to! What have you been sewing? Share some links to your creations....because we want to see! Anyone gardening? What are you growing? Anyone still buried in snow out there? Or just say Hi! I'll use the random number generator to select the 4 winners. Okay lovelies, I am off...Leah is home...half day of school today. So we are heading out for some girl time before we get the little guy from school! Enjoy your weekend...I hope you have a chance to make something beautiful! Everything is wonderful. Any item would make my day. I am watching the fog roll in trying to get motivated to clean house. I would rather go to my studio and play but I better clean. Thanks again for the opportunity to win something. Enjoy your girl time. I can hardly wait on Tuesday I am going to have the morning with my daughter who is away at school. Hi! That fabric is so cute! I think that would be my top pick, though really, winning anything would be great! I've been busy quilting (of course!). I just finished up a new quilt using Heather Ross's new double gauze fabric (will post it Monday) and I love it! The fabric is so soft and surprisingly enough, it makes for a great quilt! I'm loving the pictures of your photo sessions! Those girls are too cute! I've never photo shopped my pictures so I'm not exactly what that means BUT the thought of editing 100's of photo's makes me cringe!!! Oh....and if I'm lucky to win I think I'd like the fabric. It's so cute! I love the linen fabric so I would like to win this.Now I'm sewing a little room shoes for my daughter and this fabric would be perfect too. Those polka dot bloomers are great.What a lucky girl. Love the photos you took! Appart form the gorgeous clothes, They reflect lots of tranquility and pure children fun. If I'm lucky, I'd love the nappy bag pattern. great to have u back!! I'm in love with the nappy bag pattern!! all I can think to say is Bags Ahoy! I love those skirts in the second picture. Great work! I'd like the Kimberly bag! Cute outfits! I especially like the last one. Any give away is generous of you. I especially like the anchor fabric--very appropriate since I live on an island! I am just finishing up a chartreuse jacket. I need a snap to complete it. I'll get snaps on Monday. Meanwhile, I am working on a pair of jeans. Come by and visit me! Hey Sheree! Hope your move went smooth and well. By the looks of the easter pictures you are all moved in. Love your new designs and your new model! She and your dd are such cuties. Your photographys is coming along great! I am going to have to try and take one of your sewing classes since I am so close. Email me with the details. 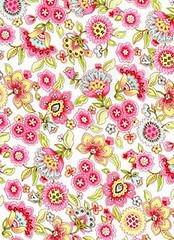 Your new designs are adorable and I just love all the yummy fabrics! gosh you have been busy! the girl's clothes are divine! well done on yet more beautiful children's clothes! I just love the fabric! The dresses and skirts are totally cute! That's quite a giveaway. 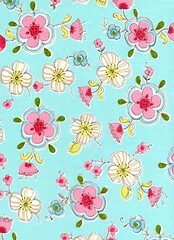 I would love a yard of the Japenese Anchor Linen! The outfits you've made are beautifully made. I love your blog and seeing what you are up to. I am just puttering away on a few little things right now. I'm just about due with my 5th child so I don't get as much sewing time. But that's okay, there is a time for everything. We are not buried in snow here in Southern BC, Canada. Trees are blossoming and daffodils blooming. The outfits are gorgeous, congrats! I would be happy with any of the items but I think I would choose the fabric, so I might stop dreaming about my projects and actually make something! Thanks for the great giveaway! Beautiful pictures. The dresses are so cute with those dots. Thanks for another great giveaway!!! I love the anchors fabric or the kimberly bag. I have always wanted to make the Nappy Bag! Maybe it's the adorable baby looking at me, but I was a gonner since the first time I saw the picture! :) I'm currently working on 4 quilts and a pencil roll. Good times! Hello! Welcome and Thank You for stopping by my blog! Here, I share a bit about how I Live, what makes me Laugh, what I Love and things I Create! I am a chemist by training (I have a PhD in Inorganic Chemistry), but instead of mixing up chemicals in a lab, I spend my days mixing up fabrics to create lovely clothing and accessories! When my daughter was born, my desire to climb the corporate ladder was succumbed by my desire to mother, so I hung up my labcoat and resigned from my job. I miss my days in the lab, but I am thoroughly enjoying my new job as a pattern and clothing designer and maker of lovely things! I am launched a new line of contemporary sewing and quilting patterns and I run an online fabric shop as well as a small online boutique where I sell my handmade goods. Here in this space, I share bits of my days, things I love and of course talk way too much about fabric and design. Please do not copy or use any of the text or photos on this site. If you are interested in using any photos or text, please email me for permission. Of course you are welcome to link here. Thanks so, so very much for understanding. Be sure to stop by my website to see all my handmade goods available for sale in the boutique, as well as a host of fabrics, patterns, yarn and more available in the creativity shop! I have two shops on Etsy...one for sewing goods and for handmade goods! Qualify for Free Fabric Giveaways, Receive my Newsletter and Announcements of New Projects and Products! to receive the Sheree's Alchemy Newsletter! This is a Flickr badge showing photos in a set called Things I have made. Make your own badge here. A happy chemist...my first homemade soaps! Side effects of a long cold winter. Congratulations! You are a winner! Happy 12-12-12 Day! Let's celebrate with a giveaway. This is a Flickr badge showing photos in a set called Adventures in Europe. Make your own badge here.